This is birth video of world’s simplest electric train. Thank you for watching from around the world. This “Train” is made of magnets copper wire and a dry cell battery. Please enjoy watching this simple structure electric train (electromagnetic train). It’s possible to get such power using a dry battery, neodymium magnets (super strong magnets which plated with metal) and a bare copper wire. A point is that a magnet’s diameter is bigger than a dry cell battery’s diameter. And an electric current flows to a coil through a neodymium magnets, and a coil will be an electromagnet only in an area between the magnet and the magnet. The electromagnet and a neodymium magnet poles repel each other at one side. The other side poles pull against each other. They work same direction, and it become a big force. The phenomenon also continues at a movement destination. 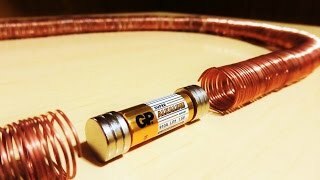 How about making this simplest electromagnetic train for science fair projects?